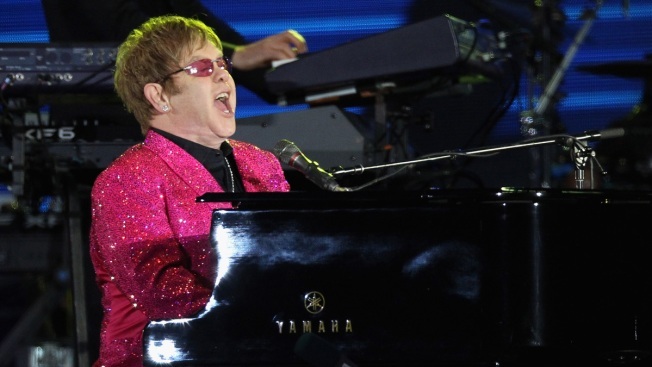 In this June 4, 2012 file photo, singer Sir Elton John performs on stage during the Diamond Jubilee concert at Buckingham Palace on June 4, 2012 in London, England. Elton John is retiring from the road after his upcoming three-year global tour, capping nearly 50 years on stages around the world. He calls it a "way to go out with a bang." "I've had a good run, I think you'd admit that," John said Wednesday, adding that he wanted to "leave people thinking, 'I saw the last tour and it was fantastic.'" The 70-year-old singer, pianist and composer said he wanted to spend time with his family. His children will be 10 and 8 when he stops in 2021, and John said he hoped he might be able to take them to soccer practice. "My priorities now are my children and my husband and my family," he said. "This is the end." John made the announcement at an event in New York in which he sat at a piano and performed "Tiny Dancer" and "I'm Still Standing." He wore his signature glasses and a colorful suit jacket that read "Gucci Loves Elton." His final tour — dubbed "Farewell Yellow Brick Road" — starts in September. It will consist of 300 shows in North America, Europe, Asia, South America and Asia. Tickets go on sale beginning Feb. 2. The yellow brick road leads to... The #EltonFarewellTour! John said he decided on his retirement plans in 2015 in France. "I can't physically do the traveling and I don't want to," he said. He also ruled out a residency but vowed: "I will be creative up until the day I die." At the Grammy Awards, to be presented in New York on Sunday, John is to perform alongside Miley Cyrus and will collect the President's Merit Award. His Vegas residency ends in May after six years. His hits include "Your Song" and "Candle in the Wind." He has won five Grammys, an Oscar, a Golden Globe for "The Lion King" and a Tony Award for "Aida." He is the recipient of a Kennedy Center Honor. He has suffered several medical setbacks of late, including a bacterial infection last year that he contracted during a South American tour and an E. coli bacterial infection in 2009. He's also suffered an appendicitis and has been fitted with a pacemaker. From 1970-76, John released 10 original studio albums and seven consecutive chart toppers. He remained a hit maker over the following four decades, from "The Lion King" soundtrack song "Can You Feel the Love Tonight" to a revision of his Marilyn Monroe ode "Candle in the Wind," released in 1997 after the death of John's friend Princess Diana and one of the best-selling singles of all time.